He is the showrunner and writer of the biggest series on television — Doctor Who and Sherlock. Steven Moffat, whose early successes include children's classic Press Gang and award-winning sitcom Coupling, discusses his career with comedian and lifelong Who fanatic Frank Skinner. Join us for this celebration of an extraordinary talent who has changed the way the world thinks about television. APA 6th ed. : (2017-02-11). Radio Times Hall of Fame. Radio Times p. 30. MLA 7th ed. : "Radio Times Hall of Fame." Radio Times [add city] 2017-02-11, 30. Print. Turabian: "Radio Times Hall of Fame." 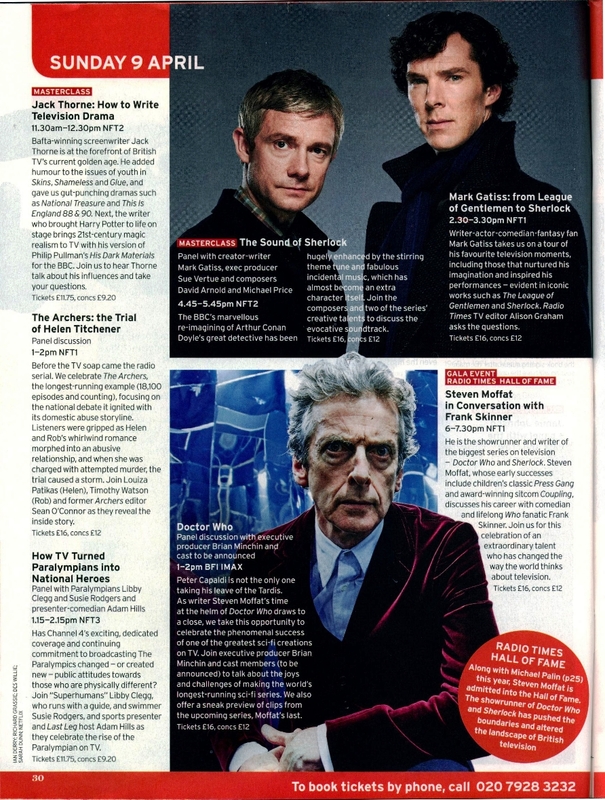 Radio Times, 2017-02-11, section, 30 edition. This page was last modified on 4 March 2018, at 01:05.